I finally had a couple of days off recently and I spent them in the forest. I brought only art supplies that had nothing to do with any of my ongoing projects, just to play. Amongst other things, I brought a stack of failed prints, some scissors and some collage glue. In addition to the kindergarten-like joy of cutting and pasting, it also felt really really good to turn failures into flowers. Watch Berning Love and Go Vote! In honor of the upcoming election, the collaborative team behind Berning Love, a romantic tragicomedy about the search for love during the waning days of the Bernie Sanders 2016 primary campaign, decided to release the film publicly one year after its television debut on PBS in Vermont. We the makers hope that it inspires you to increase your civic engagement, get involved in your community and also, next week—GO VOTE! For information about what’s on your ballot, check out Ballotpedia. How can we thrive, and not just survive, in the Silicon Valley? 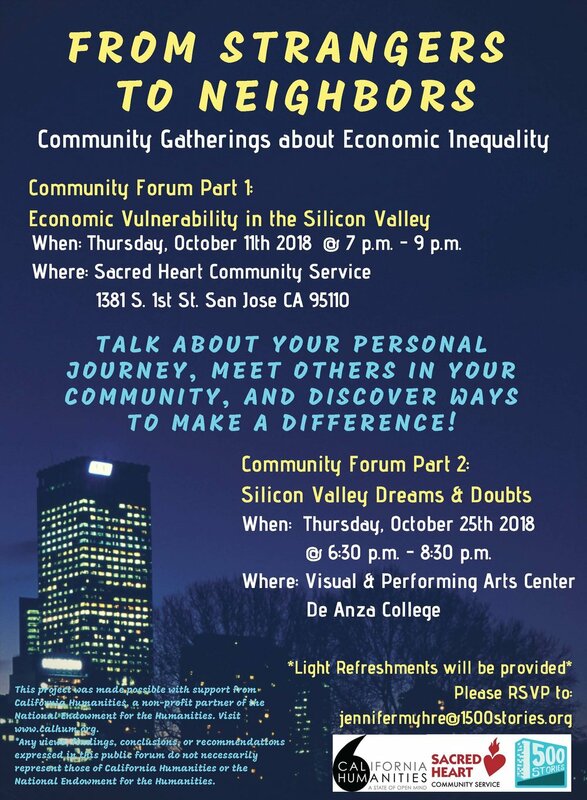 Join the 1500 Stories Project and Sacred Heart Community Service for two evenings of community building around economic inequality in the Silicon Valley. Come share your story, meet others in your community and discover ways to make a difference. On Thursday October 11, 2018 from 7-9pm in the Learning Center at Sacred Heart Community Service, we will share our experiences with economic vulnerability. We will deepen the discussion on Thursday October 25 from 6:30-8:30pm in the Visual and Performing Arts Center at De Anza College, exploring our Silicon Valley dreams and doubts. 1500 Stories is a collaborative art and digital storytelling project about economic inequality in the U.S. and is honored to partner for these public forums with Sacred Heart Community Service, a leader in addressing the root causes and consequences of poverty. Visit 1500stories.org and www.sacredheartcs.org to learn more. These forums are made possible by support from California Humanities, a non-profit partner of the National Endowment for the Humanities (www.calhum.org); views expressed at the forums do not necessarily represent those of Cal Humanities or the NEH. Contact jennifermyhre@1500stories.org with questions. I'll be showing some very preliminary footage and sharing lots of archival materials from my historical documentary about Jane Addams and the U.S. government's propaganda and surveillance campaign against feminist peace activists in the wake of the First Red Scare. The talk is on the De Anza College campus--the talk is free but daily parking at De Anza is $3. Also my colleague David Howard-Pitney is bringing his guitar to play a piece of music from the time period, so it should be good times all around as we learn about a period in U.S. history marked by xenophobia, anti-feminism, and violations of civil liberties by the surveillance state. ;) This talk is sponsored by the California History Center. Come on out to the Euphrat Museum of Art for entertainment and refreshments. Three of my own works are in the current exhibition about caregiving, as well as a whole bunch of totally fantastic works across a range of artistic media. The show is up until March 22 and if you can't make the reception, museum admission is free and it is open from 10am-3pm Monday through Thursday. Learn more here. Two narratives, one video and one audio, from the 1500 Stories project, are in the show entitled Showing Up with Care alongside a related socially engaged art piece entitled All Work Has Dignity. All three pieces ask views to engage with the labor of carework and to think about the ways in which we value and compensate different types of work. You can view the works between now and March 22, 2018 at the Euphrat Museum of Art. Join us for the reception on Wednesday, February 21 from 5:30pm-7:30. 1500 Stories is a collaborative art and digital storytelling project about economic inequality in the U.S. The film I collaborated on in 2016 airs next week on PBS, which is pretty much the most amazing outcome I could have hoped for. 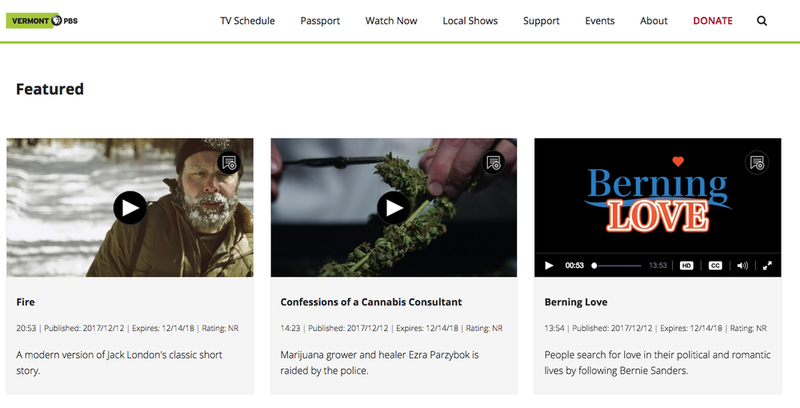 You can catch the trailers for Vermont PBS's Made Here on Facebook. In October, I did a series of workshops for folks in San Marcos CA about economic inequality, on behalf of the 1500 Stories project. 1500 Stories is a collaborative art, digital storytelling and civic engagement project about rising economic inequality in the U.S. Storygatherers in California have already conducted over 150 in-depth interviews with people from all walks of life, about their struggles and their work and their hopes at different economic positions. Storygathering has also begun in Wisconsin and Ohio. Here, you see a socially engaged art piece called the Stacked Deck, which asks participants to think about and reflect on economic inequality as it is expressed through a deck of thirteen cards featuring documentary photography. The project now has piles of unedited audio and video and is raising funds to edit those stories and make them publicly available on the website and for use at public discussions and forums about economic inequality. Consider making a donation to the project here, and be sure to choose "Other" in the program box and type in 1500 Stories. Everyone has a story to share. Help the project get these stories out. This spring I wrapped up most of the research and development on my next documentary short, called The Spider Web, about the U.S. War Department's surveillance and propaganda campaign against feminist pacifists in the early 1920s. I visited archives in Chicago IL, Swarthmore PA, Ramapo NJ, and Washington DC. I also filmed interviews with Louise Knight, Jane Addams' biographer, and Dr. Kim Nielsen, who wrote an excellent book about anti-feminism during the First Red Scare. In the process of working on what will be my first historical documentary, I have discovered that I am a secret historian and archive nerd. Who knew?! Co-producer Katherine Chivers accepting the award on behalf of Berning Love, for overall best documentary short (choice of both directors and audience) at the Rincon Film Festival. Caribbean Premiere of Berning Love on March 30! Berning Love's festival run continues! Visit http://www.rinconfilm.com to get tickets or more information. Visit http://www.berninglovethefilm.com to see the trailer for Berning Love. In the Vermont area? Check out the U.S. premiere of Berning Love on March 19! I will be sharing archival materials I gathered for a historical documentary I am in development on about the feminist pacifist movement from 1915-1925 and the ways in which the federal government engaged in a direct campaign to splinter the women's movement in the wake of the first Red Scare in the U.S. Visit the California History Center website for more information about the CHC and about the exhibit currently on display through March 23 about the Women's International League for Peace and Freedom. A few members of the Berning Love crew (myself included) will be visiting Berlin this week for our screening as part of Shorts Block 2 on Thursday February 9. We are insanely excited about this! Learn more about the festival here. Berning Love is a sweet and funny documentary short about love and politics during the waning days in Washington DC of the Bernie Sanders primary presidential campaign. You can learn more about the film, for which I was co-editor, associate producer and director of research, here. Berning Love, a documentary short about the search for love during the waning days of the Bernie Sanders primary campaign, was accepted into the Bay Area Women in Film and Media Shorts Showcase. I filled many roles on this film, including director of research, co-writer, assistant producer, co-editor and occasionally second camera. :) The showcase promises to be a wonderful evening of film shorts that had women in leadership roles behind the camera. The showcase is on December 8 starting at 6pm at Second Act, 1727 Haight St, San Francisco, CA 94117. You can get tickets to the event here. Below are some outtakes from the film--Dr. Doug Pierce, political scientist, discussing the role of emotion in politics. These particular clips were shot by Sujatha Bagal, produced by Katherine Chivers and edited by me.